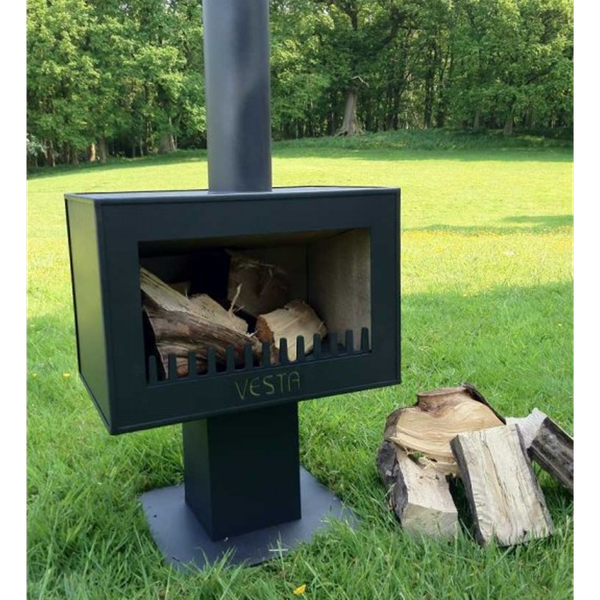 The stylish log burning Fiesta Garden Stove is designed to fit perfectly with modern gardens and contemporary pavilions. The large firebox is fully lined with firebricks and has a built in grate allowing spent fuel and ash to fall through into the collection box ready for quick and clean disposal. Made from rugged steel plate and treated with a high temperature silicone coating, the Fiesta is built to last. Producing a massive 20KW of heat the Fiesta will keep you and your guests warm long after the sun goes down. Each Fiesta comes complete with a one metre flue section and requires no assembly. It is fully seam welded so you can rest assured that your Vesta Fiesta pavilion stove will outlast chimineas and gas patio heaters. Garden stoves are ideal in Britain as they are capable of throwing out a lot of heat on our cold evenings. They also need no gas and can be used to burn garden waste. This garden stove is totally unlike any chiminea on the market. It is fully lined with high efficiency linings so the fire burns as clean as an indoor wood burner with minimal smoke. The garden stove top is hot enough to boil a kettle or cook a great steak. Dimensions and technical specifications available on the ‘Specifications’ tab. Our Stoves come in a range of styles to suit any home interior, from traditional cast-iron stoves, to modern contemporary designer stoves. Strippadoor constantly negotiates with carefully chosen couriers direct delivery rates to ensure your goods are delivered safely and at the best possible carriage rates. As a result the price once quoted, is fixed. Should you wish to use this service we will make all arrangements for you, however you will pay the courier directly – thank you.